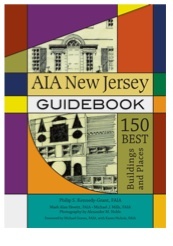 AIA New Jersey is proud to announce the publishing of the AIA-NJ 150 Best Buildings and Places as a book. During the celebrations of AIA’s 150th Anniversary, AIA New Jersey members nominated buildings, places, and structures from around the state to make the official top 150 listing. That list, released in 2007, has now been put into book form, with pictures and descriptions of each location. A special pre-order discount is being offered to AIA-NJ members. Order your book today, see discount coupon at the end of this article. The AIA New Jersey Guidebook reveals the state’s rich architectural legacy and the eclectic mix of periods and styles that make it unique. Only in New Jersey can you find the cradle of America’s industrial revolution, stately Victorian inns, and distinctive “Doo Wop style” motels. The 150 structures depicted in the AIA New Jersey Guidebook include both justly renowned buildings and hidden architectural gems. The book’s authors— expert architects and building historians— give equal attention to the works of such modern masters as Louis Kahn and Frank Lloyd Wright and to the ballparks and diners that give the Garden State its local flavor. Stunning color photographs capture the beauty of New Jersey’s architectural heritage. Thorough descriptions of each building explain its historical significance and architectural features in clear, direct language. Compact and organized by region, the AIA New Jersey Guidebook is a wonderful traveling companion for road trips across the state or sightseeing day trips. Start your tour of the Garden State today! PHILIP S. KENNEDY-GRANT, FAIA, is the principal of Kennedy-Grant in Bernardsville, New Jersey, and has served as the editor of Architecture NJ. He received degrees from the U.S. Military Academy and the University of Notre Dame. MARK ALAN HEWITT, FAIA, is an architect, preservationist, and architectural historian. He received degrees from Yale University and the University of Pennsylvania. MICHAEL J. MILLS, FAIA, is the principal of Mills + Schnoering Architects, LLC, in Princeton, New Jersey. He holds degrees from Princeton University and Columbia University and completed postgraduate work at ICCROM in Rome, Italy. ALEXANDER M. NOBLE is a professional photographer. He has photographed and written a regular column for New Jersey Countryside Magazine.